If fans are unable to replace air conditioners, they can provide additional cooling, especially on mild summer days. Replacing fans for air conditioners can lower energy use by 60% or more. Install a programmable thermostat if you do not have any. By simply turning your thermostat back 10 to 15 degrees for 8 hours you can save as much as 10% on your cooling bill. You can do this easily using a programmable or a setback thermostat. In summer time set your thermostat as high as possible. If the difference is less between the indoor and outdoor temperature your overall cooling will be lower. One must install the room air conditioners on a flat. Even surface so that the inside drainage system and other mechanisms do not hinder its effective operation. Set the fan speed on high, but not on very humid days. It is more convenient and comfortable to set the fan speed on low hen humidity is high. The low speed on humid days will make for a more comfortable home by eliminating more moisture from the air. Use an interior fan together with your window air conditioner to spread the cooled air more effectively through your home without greatly increasing electricity use. It is not recommended to place lamps or televisions close to your air conditioning thermostat. The thermostat senses heat from these appliances, which can cause the air conditioner to be used longer than necessary. It is important to install the unit in a shaded spot on the home’s north or east side. Efficiency may be decreased in the result of direct sunshine on the unit’s outdoor heat exchange. Be careful when planting trees and shrubs to shade air-conditioning units so as not block the air flow. A unit operating in the shade uses as much as 10% less electricity compared to the same one operating in the sun. The right time for Room air conditioners to be covered or removed and stored is winter. It is important to check your unit’s air filter once a month and clean or replace filters in case of necessity. 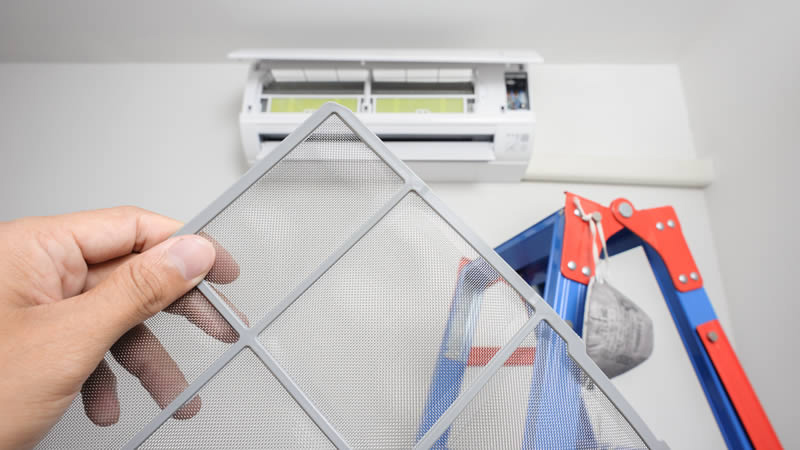 Your air conditioner energy consumption can be reduced by 5% to 15% in the result of keeping the filter clean. Clogged drain channels prevent a unit from reducing humidity, and the resulting excess moisture may discolor walls or carpet. Channels usually can be cleared by passing a stiff wire through them. Holes in the seal between the air conditioner and the window frame make it possible for cool air to escape from your home. This seal can be spoiled because of moisture so check the seal every year to ensure it makes contact with the unit’s metal case.